Imagine driving home from work one evening, anxious to get home for dinner and not realizing that you’re driving a tad bit over the speed limit. Or maybe you’re fiddling with the radio and don’t realize that you’re swerving in and out of your lane. Or perhaps your taillight is out or you were daydreaming and missed a stop sign. All of this in plain view of a marked car filled with police supplies and an officer in duty gear. Whatever the case, the cops are onto you, having already called in your license plate on the police radio. You see the officer waving at you in hatch gloves, telling you to pull over. In a situation like this, it’s easy to freeze up and panic. You may start to sweat, have visions of pepper spray and handcuffs in your head or completely forget where to pull over or what to do. To ease your worries, it’s helpful to know the rules of the road as well as your rights ahead of time so you’re aware of what to do if you happen to get pulled over while driving. However, you should keep in mind these tips only apply to minor driving violations such as speeding or missing a stop sign. More serious violations, such as driving under the influence or transporting certain gun accessories, without proper licensing, may require an additional set of procedures. But no matter what your violation may be, it’s important to keep these tips in mind and to remain as calm and polite as possible. First and foremost, it’s important to remember two main things if you’re being pulled over by the police. First, you should remember to protect your life and the life of the police officer. Police officers are trained to only stop vehicles in safe locations. You should pull over immediately in a safe area. Officers know their patrol areas and will not stop a car where they feel unsafe. Therefore, they sometimes follow people for miles before stopping them. If you do not stop immediately, the officer may suspect that you are hiding weapons, like automatic knives or drugs or even preparing an ambush with other occupants in the vehicle. Second, don’t say or do anything that will make you sound like a threat. Remain calm, apologetic, and polite, and don’t argue with the officer. Even if you don’t believe you are guilty, don’t fight back, or you could be introduced to an expandable baton. Save all arguments for the courtroom, should you get a ticket and decide to fight it. 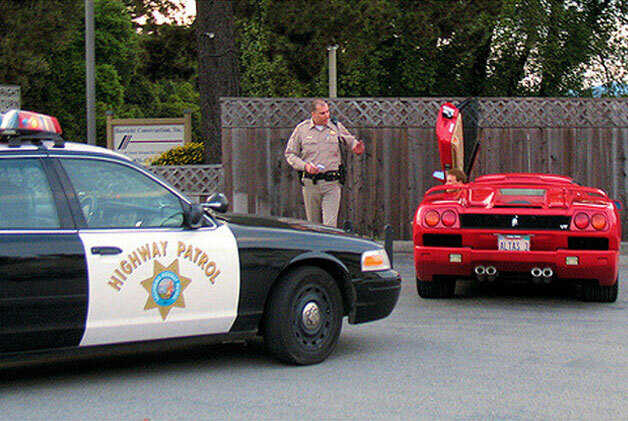 Now, let’s discuss the do’s and don’ts of getting pulled over in more detail. Turn on your car’s hazard lights or flashers. If you’re being pulled over, you want the officer to know that you’ve seen him and understand that he is asking you to pull over. However, you can’t always pull over right away due to safety reasons. At the same time, you don’t want the officer to think that you’re ignoring him or trying to flee. Let the officer know that you’re acknowledging him. Turn on your hazard lights until you’re able to pull the vehicle over. Slowly pull your car over to a safe area. The right side of the road is always the safest place to pull your vehicle over to, but you can also pull into a parking lot or side street (preferably a well-lit street) as well. You should drive slowly and safely so the officer doesn’t think you’re trying to flee. Remember to use your blinker before changing lanes. Remain calm and stay in the vehicle. 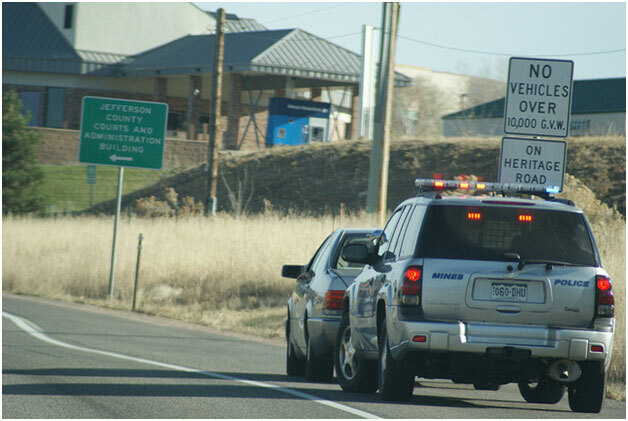 Never exit the vehicle, which may make the officer think that you are trying to flee or are showing signs of aggression. Instead, stay as calm as possible and remain in your vehicle. Turn off your vehicle and turn the radio down. After you’ve pulled the vehicle over, turn your vehicle off and turn the radio down. If you’re chewing gum or are smoking a cigarette, spit out the gum or put the cigarette out. Turn on your vehicle’s dome lights. If it’s dark outside, turn your dome light on so the officer can see you and your vehicle clearly. Remain level-headed and polite. Getting pulled over is a nerve-wrecking and stressful experience, but you should remain as calm as possible. It’s important to remember that you will probably only need to pay a fine for minor traffic violations and there isn’t anything to get worked up about. Put your license, registration, and insurance card on the dashboard. You can do one of two things: Put your license, insurance card, and registration carefully on your dashboard before the officer approaches your vehicle, or wait for him to ask for your documents. If you put your documents on your dashboard, make sure that you put your hands on the steering wheel as he approaches your vehicle. Let him know that your documents are on the dashboard and that you’re going to reach for them. Before the officer approaches your car, trusty streamlight stinger in hand, roll your window down. Keep your hands on your steering wheel. Remember, the police officer has no idea what he’s going to be getting into before he approaches your vehicle. The last thing he wants to test is how well his tactical vest works. To ease his worries and to keep him from suspecting the worst, place your hands on your steering wheel so he can see them. Keep your hands in plain sight. Don’t reach for anything without telling him what you’re doing first. If you need to reach for your license and registration, be sure to tell him what you’re doing. Keep your hands on your steering wheel if you are not gathering your documents. Remain in your vehicle. Remain in your vehicle unless an officer asks you to get out. If you do need to get out, keep your hands in plain sight at all times. Avoid furtive movements. An officer will likely look for signs of “furtive movements,” an indication that you are trying to hide something under your seat. Don’t admit to your violation. If you don’t think that you’ve done anything wrong, you don’t need to admit to the violation. However, you shouldn’t fight it either. Save your arguments for the courtroom. Anything you say in your vehicle can be used in court, so you should remain calm, polite, and compliant. Apologize. If you know why you were pulled over and you admit to it, you can politely say: “I’m sorry.” If you’re polite and apologize for your traffic violation, it’s possible he may let you go with a warning. Don’t act overly eager. Even if you’re nervous or anxious to get home, don’t try to rush things. Rushing the process may make you look guilty of something, causing reason for concern. Additionally, you don’t want to quickly dig around in your vehicle for your license and registration or it may look like you’re frantically reaching for your ankle holster. Be mindful about your movements. Remember, officers are regular victims of violence and assault. Police officers put their lives in danger daily, and they have every reason to be cautious while doing their jobs. Try not to reach for your license or registration too quickly, and avoid reaching in your pocket, the glovebox, or in a bag without letting the officer know first. Inform the officer of any weapons you may have. If you have a gun, shoulder holster, asp baton or any other weapon on you, be sure to inform the officer. Certain states have “must inform” laws, where it’s mandatory to inform an officer of any weapons on you. Weapons may include tactical gear, pepper spray, or automatic knives. States with “must inform” laws allow the police to ask for any weapons and hold them until you are released. Remain civil and respectful. Remember, officers are just doing their jobs and are trying to make the world a safer place. Avoid fighting, harassing, or disrespecting the officer and they should be out of your hair in no time at all. Use your Fourth Amendment right. At the same time, you don’t have to give consent to have your vehicle searched. Even if you don’t have anything to hide, it’s a good idea to decline the search. Clearly say “I don’t consent to a search” loudly enough for your rejection to be recorded. However, an officer will be able to search your vehicle without your consent if he has probable cause. For example, he may have probable cause if he sees a bottle of liquor on your car seat or smells something concerning. Additionally, officers generally can’t search your cell phone without a warrant or your consent. Save any arguments for the courtroom. If you plan to fight a ticket, save your arguments for the courtroom to be handled in front of a judge. Let the officer do the talking and only respond when necessary. If given a citation, accept it. Accepting and signing a citation is not the same as admitting to your violation. If an officer issues a citation, he’s simply asking you to acknowledge that you’ve received the citation, which requires you to either pay a fine or show up to court. If you don’t accept the citation, you could be arrested. Merge back into traffic slowly and safely. When you’re free to get back on the road, take a few moments to carefully gather your thoughts and calm down if you’re upset. Take deep breaths, center yourself, and clear your head before getting back on the road. When you’re ready to move your vehicle, carefully and slowly merge back into traffic. Be courteous of your words, actions, body language, and emotions. Don’t say anything that the officer can use against you in court. Remain polite. Don’t flee the scene or run. Don’t touch the officer and keep your hands in plain sight. Even if you are innocent, don’t argue with the officer and don’t tell the officer that you will be fighting the ticket. Make a mental note of the officers’ patrol car numbers or badge, and write it down after he leaves. If you happen to get arrested, immediately ask for a lawyer. He can search your clothing, belongings, and/or body. He may search your vehicle. You may be asked to perform a sobriety test. You may remain silent, but an officer may attempt to ask you questions. Remain calm and know that anything you say may be held against you. It’s no question that nobody likes getting pulled over. It’s easy to get nervous and worked up, especially if you don’t believe you did anything wrong. However, it’s necessary to remain calm and polite no matter what you believe. If you’re driving home and suddenly hear sirens behind you, it’s important to pull over as safely as possible without endangering anyone else in the process. Remember, the police are only trying to keep you and other drivers on the road safe, so it’s important to understand where he is coming from and remember why he’s doing his job in the first place. If you get pulled over, remain polite, calm, and compliant. Notify the officer of any weapons you may have on you, including gun accessories, automatic knives, or holsters. Showing honesty and respect will only let the officer know that you’re trustworthy and don’t mean any harm.